For lot of applications, the critical parameters such as temperature, humidity, pressure etc. need to be monitored and recorded in real time preferably with an alert system to generate alerts in case the parameters exceed the permitted levels. These are generally known as real time monitoring systems. 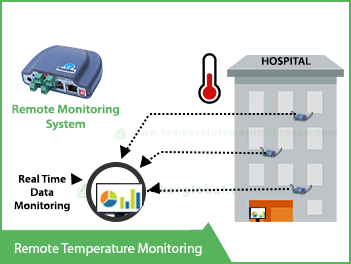 Temperature is the most common parameter being monitored and hence is commonly referred as remote temperature monitoring. 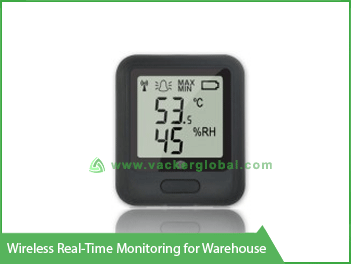 Temperature & Humidity monitoring of warehouses which are used to store temperature sensitive products such as medicine, chemicals, food, fruits & vegetables etc. 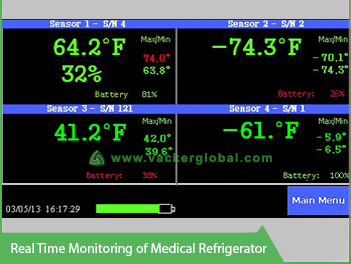 Temperature & humidity monitoring of walk in freezers, cold rooms, cold storages etc. which are used to store vaccines, medicines, frozen food etc. Monitoring of Temperature, humidity, engine conditions etc. for vehicles, reefers etc. which transport temperature sensitive goods. Temperature Monitoring along with humidity, water leakage etc. for data centers and server rooms. Temperature monitoring is very critical for server rooms since server panels generate lot of heat. Monitoring of temperature, humidity and pressure for patient rooms, Intensive care units, clean rooms, clinically isolated rooms etc. in hospitals. Temperature, humidity and pressure monitoring in clean rooms in manufacturing environments. 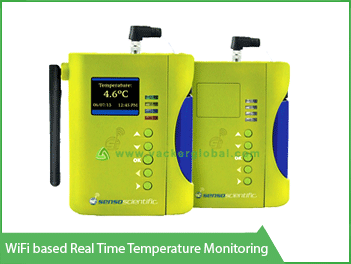 Temperature monitoring of furnaces, kilns, autoclaves, industrial equipment, processing machines etc. Temperature monitoring during concrete curing process. The basic principle of all such systems involve lot of sensors such as temperature sensor, humidity sensor, pressure sensor etc. These sensors continuously collect data at preprogrammed intervals known as sampling interval. The sampling interval can vary from micro seconds to hours based on the criticality of the parameter being monitored. All the sensors continuously communicate the collected data to a central base station. The mode of communication from the sensors to the base station can be in different modes as explained in the next article. This base station transmits the collected data to the internet. Also, this base station continuously analyzes the data for any alerts. If any of the parameters exceed the preprogrammed alert levels, alerts such as email, SMS, voice call etc. will be generated to the operators. Integrated with Temperature and Humidity Data Loggers which can record months of data continuously. Current readings of temperature and humidity of the refrigerator will be displayed in the local screen. Also door opening monitoring of the refrigerator can be provided separately. Data can be recorded in the monitoring system as well as over Local Area Network. Data logger capable of storing 80,000 readings. The sensors are connected to an Ethernet system through CAT6 cables and connectors, just similar to connecting a computer, printer etc. You will need to have Ethernet ports near to each sensor. These can be powered from an electrical plug or can be POE type (Power over Ethernet). There will not be a separate base station, but a computer in the network can act as the base station. Here there is no Ethernet cabling required. The communication between the sensor and the central station takes place through WiFi routers used for connecting all other computers. The WiFi communication needs power and if you need continuous data transmission, you may have to go for sensors which are powered through an AC supply. There are devices available which continuously collect data and stores in itself and transmits the data only once or twice in a day. Such systems can work on its own battery for a long duration since it is connecting to WiFi only once or twice in a day. In this case also there will not be a separate base station, but a computer in the network can act as the base station. The communication reliability depends on the strength and range of the WiFi router. These work on Radio frequency. While selecting a device you have to check that the device works on the radio frequency approved by the local authorities. The supplier has to take approval for the device from the authorities. These devices have a comparatively long range of communication from the base station. The base station acts as a receiver and the sensors act as transmitters. There will be continuous interaction between the sensors and the base station. Such sensor operates with a very low power requirement and hence can have a long battery life without supporting power supply. Zigbee is the latest technology with a direct range of up to 1 km in air. If there are obstructions in its path, the range comes down accordingly. Zigbee operates in a permitted frequency range in most of the countries. Zigbee sensors also operate on very low power requirement and hence can operate without electric power. These might be the most economical type of monitoring system. Each sensor has to be connected to an Ethernet port and does not require electric power. These operate on POE (Power Over Ethernet) Also this may not have its own memory. There will be a central software in one of the PCs or server in your Ethernet system. Each sensor can be configured to this software. The sensor is simply inserted into an Ethernet port and it starts working. 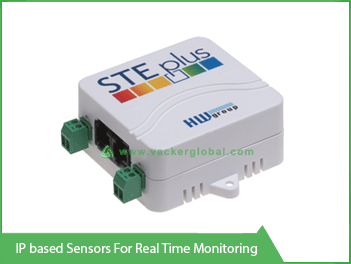 How to select a real time monitoring system? What are the parameters (eg. Temperature, humidity, pressure etc.) you want to monitor for each asset? If you have different assets such as refrigerators, cold rooms, warehouses etc. you may have to list out the parameter to be monitored for each asset. What is the type of communication you prefer viz., WiFi, Rf etc.? If you want flexibility to frequently relocate your assets such as lot of refrigerators, small freezers etc., you may choose WiFi, Rf or Zigbee mode of communication. Also if you have moving racks in a warehouse it is ideal to use WiFi, Rf or Zigbee. If you have only fixed assets you can go for Ethernet or IP based systems which may work out to be economical. What are the type of alerts you want viz. Email, SMS, voice call, local hooter etc. The sensor should continue to function even in case of power failure or communication failure. Hence, the sensors should have its own memory store the data and should be able to transmit the data to the base station once power or communication is restored. If generating alert is your priority, the alert system should continue to function even in the case of power failure, server failure or communication failure. This means that the alert system should be independent and should have a battery backup. What is the accuracy required by you for each parameter? Eg. if you want an accuracy of 0.1 °C, you may have to select accordingly. A sensors with 0.5 °C accuracy will be cheaper than that of 0.1 °C. What is the memory capacity of each sensor? A sensors with memory capacity of 8000 readings means that it will store 8000 readings at a time. This means that if readings is taken every minute, the memory will last for 8000 minutes which is almost 5.5 days. eg. If you are afraid of frequent power failure or server failure, you may prefer to go for sufficient memory capacity. If you are following US standards, you may prefer to have 21 CFR Part 11 compliant devices. This means that the manufacturer of the device should have tested the devices, software etc. for compliance with 21 CFR Part 11. Is there an annual fee for the system or is it a one-time package? Is it easy to calibrate the sensors each year? If the sensors are not connected to power, you may need to check whether the battery of the sensor and the base station are rechargeable type. Also please check how long the battery lasts after each recharge. For sensors without a power supply, the sensor should generate an alert when the battery charge goes down to critical levels. It will be very easy if the software can be operated from a web browser instead of installing a software. In such case, you can check the current data from any computer using your user id and password. Also, if it is browser based you can check on your mobile phone as well. If you are more technically inclined you may prefer to use a mobile based application and you may like to check whether the supplier has a mobile application. You may use this evaluation sheet for evaluating different manufacturers while selecting a remote monitoring system. Do you want to record the data from a truck / van in the same system? It is a common scenario that a customer will have a lot of trucks delivering goods from the warehouse and you may want to record the data from the truck. 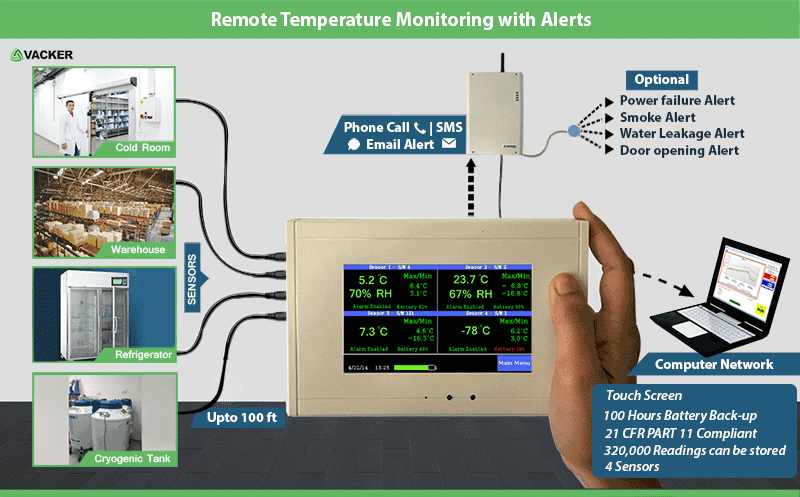 One option is definitely to use GPRS based real-time monitoring system. You may prefer to use a single set of software for your warehouse and the trucks. An alternate option is to record the data inside the truck while it is out of your premises and transmit the data to your warehouse as soon as it comes back to the warehouse. In this case, you may not be able to monitor the temperature while the truck is on the move. But as soon as it reaches your premises it will automatically transmit data to your central system. This can be achieved through WiFi, Rf or Zigbee type of sensors. You can have a receiver (base station) in your loading/unloading area. One sensor will be installed in each vehicle. While the truck is within the range of the receiver, it will continuously transmit data to the receiver. However, as soon as the truck moves out of the premises the sensor starts recording in itself. When the truck reaches back to the warehouse it transmits all the recorded data automatically. This system will be much cheaper than a GPRS based system. Further more details you can see videos in following links related. 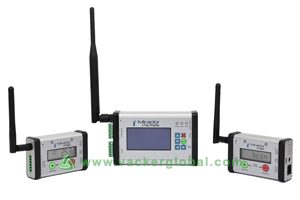 How to Configure Temperature and Humidity recording and Alert System Data Logger.